We cordially invite you to find your place with a body of believers taking the Gospel message to the streets through community outreaches in the parks, feeding and sharing the love of God with people and miracle services. Many have received their physical healing while attending services. Mission teams hold pastors conferences and crusades in Asia and other locations worldwide. Add us to your Facebook. For more information, message us in our contact page or click here to like our Facebook page for updates. Thank you very much and hope to see you all who are in this area. 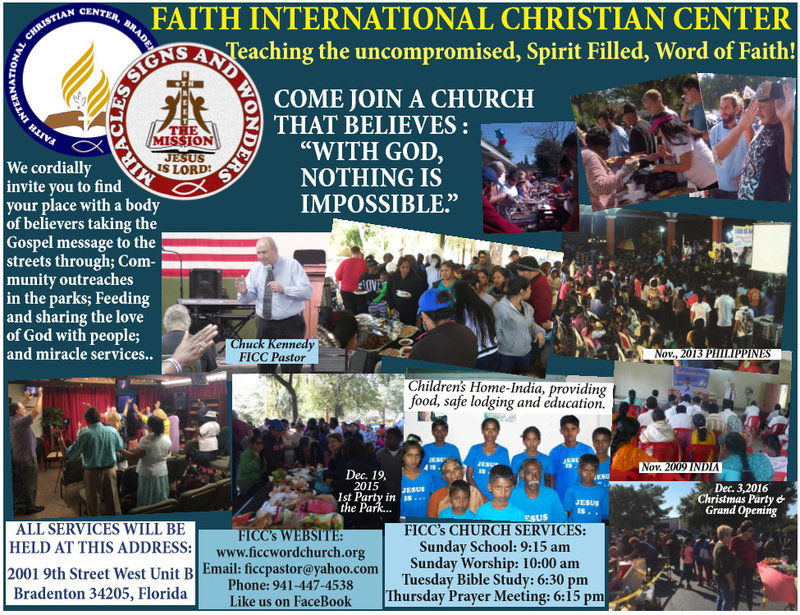 Join us and be blessed. JESUS the Christ, the Great Intercessor, the Living Word! "God is not against you having things. He is against things having you.." -Pastor Chuck A tribute to Bonnie Cornelius... "For to me to live is Christ, and to die is gain. Philippians 1:21" 1 Cor 4:20 & Rev 12:11 THE WORD OF HIS POWER -Pastor Chuck Kennedy Remembering Brother Bill Riethmillers..